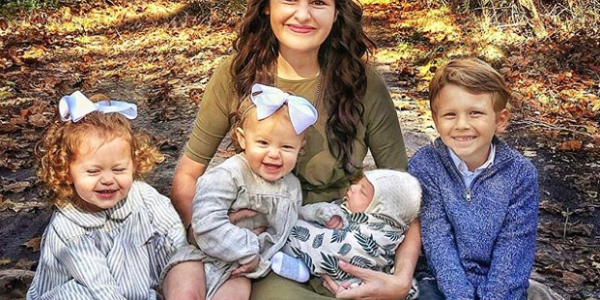 Mum-of-four Charlotte Chatman had just welcomed a baby boy when people began messaging her on Instagram. Fitness coaches were insistent, asking her to try their post-baby workouts and diet pills. Her newborn was just one-week-old, and the mum was shocked at the audacity of these strangers. “Leif was barely a week old when my inbox started to get flooded with hundreds of ‘Hey Girl, I can help you get your body back’ messages,” she said. She could not believe that these people were using her postpartum body to make money and pushing women to work out so soon after their delivery date. “I found out that these coaches send thousands of emails a day to other brand new moms…and something needs to be said. There are SO many women who don’t realize that they shouldn’t be exercising or dieting so soon after childbirth and sign up for these without consulting a doctor,” she continued. “There are SO many women who think that they are ‘expected’ to immediately fit into their jeans after childbirth and sign up because they think something is wrong with their body for not instantly looking perfect. Charlotte was particularly upset with the phrasing ‘get your body back’, saying that it “implies that, at some point, my body was missing or lost. She decided to take the opportunity to warn other mums against the dangers of listening to these ‘fitness gurus’ and instead, listen to their doctors first and foremost. “So, new mamas, hear me out: let your body heal over time, listen to your doctor, and more importantly, make the health of you and your newborn child the focus of your postpartum journey…not the body that these solicitation emails are trying to sell you. “Respect your postpartum,” she urged. Ignore the pressures of unrealistic body expectations. As a mum, your body does amazing things. It can transform to create and carry another human being. That is what we should pride ourselves in. We should wear our stretch marks, extra skin, and all the other marks of motherhood with pride.